With the establishment of CIBIL, Banks have taken a breather as Fly By Night Loan takers and defaulters have been permanently banned from extending Loan facilities. Harshal Chandorkar, VP of CIBIL said that according to Data Mined by them, Banks and Financial Institutions are Approving Loans for Customers with High CIBIL Transunion Score. 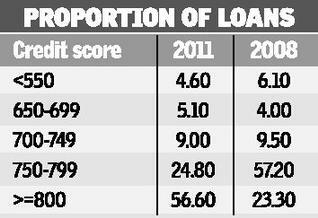 Score Card below suggests that 90% of the Loan Approvals so far in 2011 are given to consumers with CIBIL TRANSUNION Score greater than 750 of which bulk of them have score greater than 800. Does High CIBIL Transunion Score Approves My Personal / Home Loan ? Your chances of approval are VERY HIGH. However, bankers also see the Income [as appearing on Income Tax Records, no Black Money] and your current Loan Burden if any + EMI burden from fresh loans. Banks have internal credit policy before approving any loans and in the worst case they approve for an EMI equal to 40% of your Monthly Disposable Income. So start behaving responsibly with your Credit and Build Repayment Track Record which will help boost CIBIL Transunion Score. You can Order Your CIBIL Transunion Credit Report Now. This entry was posted on Sunday, September 25th, 2011 at 6:50 am	and is filed under Credit Adviser.